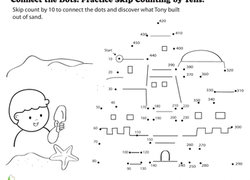 Connect the Dots: Practice Skip Counting by Tens! In this second grade math worksheet, your child will practice telling time by drawing the hands on clocks, then adding up the total amount of time passed. Children skip count by threes to connect the dots and discover the hidden picture. 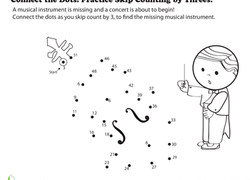 Connect the Dots: Practice Skip Counting by Fours! Children skip count by fours to connect the dots and discover the hidden picture.